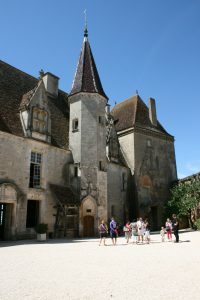 The formerly fortified village of Châteauneuf, has retained its medieval character and was named after the castle Chateauneuf-en-Auxois, which is located on the western edge of the town. The silhouette of the village is made up of a substantial number of towers of the castle, the church and the houses of the village. Except of the castle, the village still retains some remnants of its fortifications. In the Middle Ages, it was a stage on one of the pilgrimage routes to Santiago de Compostela. The medieval city is one of the Plus beaux villages de France (most beautiful villages in France). The place is located on the crest of a truncated cone-shaped peak, overlooking the Burgundy Canal. 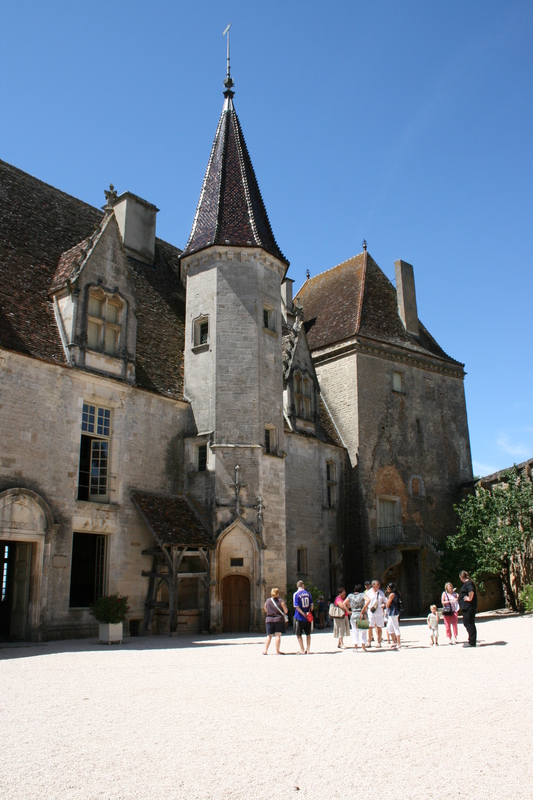 It is situated approximately 42 kilometers southwest of Dijon and about 35 kilometers northwest of Beaune. In the streets of the old town you will be immediately caught by the quaint character of the medieval settlement. The sometimes simple, but also stately homes, all in the best restoration and maintenance status are from the 14th to 17th century and are built of solid stone masonry. Galleries, stair towers and sometimes even correct towers attest to the wealth of the former owners. 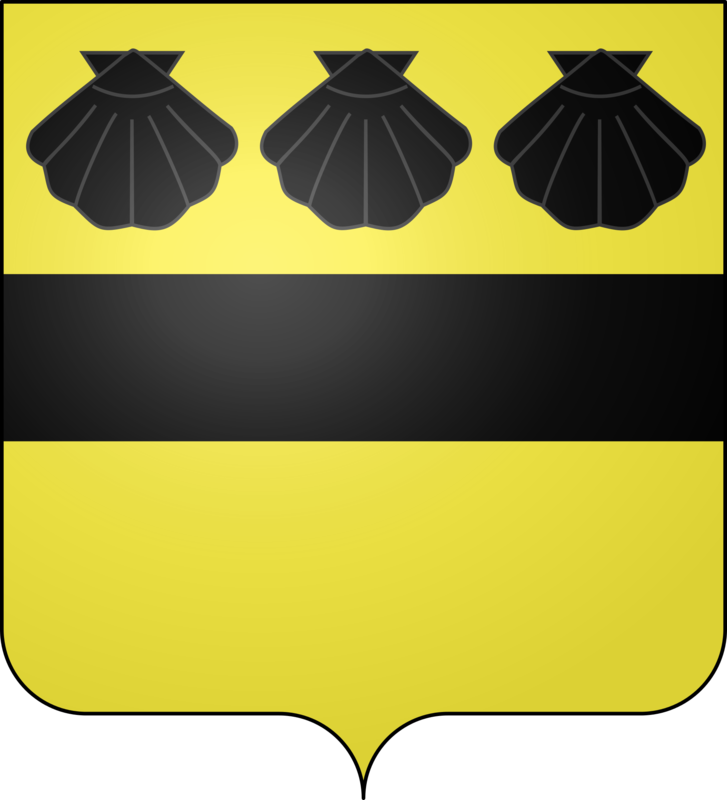 These were generally no simple farmers and craftspeople, but rich wine merchants and traders from the nearby centers Beaune and Dijon. The parish church of the 16th century contains remarkable statues of St. John and St. James from the 15th century, St. Philippe from the 16th century and a “Madonna and Child” from the 14th century. All four statues are listed buildings. The castle Châteauneuf dominates the landscape of Auxois and should, after its construction as a fortified castle in the 12th century, secure the surrounding plain and the road from Dijon to Autun militarily. The fortress was built on the initiative of the Lord of Chaudenay for his son. His castle was situated further south and today you will only find the ruins. Today, especially the rectangular keep with its little window hatches, emerging from the ramparts cylindrical towers, the loopholes in the walls, the round towers and the two former entrances witness the time of origin. The castle was surrounded by a wide moat, separating it from the village. 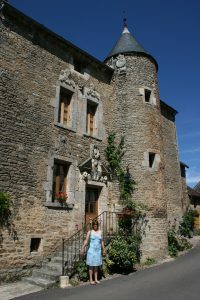 In the 15th century, Philippe Pot, enlarged the castle and made it cozier. The courtyard was limited by two gothic accommodation wings. The main wing and the observation room was the generously sized and fireplace equipped Grand Logis. Inaugurated in 1481, the chapel is painted in the colors of the Pot family: black and red. Here is a replica of the grave monument of Philippe Pot, the original is shown in the Louvre. From the windows of the “round room” you can look down to the wide Auxois country and the foothills of the Morvan.